Those who tuned in to the address given on Thursday by Attorney General Jeff Sessions to law enforcement officers in Fort Wayne, IN will have heard him say, “I would cite you to the Apostle Paul and his clear and wise command in Romans 13, to obey the laws of the government because God has ordained the government for his purposes” in defense of his policy of separating immigrant children from their parents. This statement aimed at “church friends” was reiterated by White House Press Secretary Sarah Huckabee Sanders, daughter of prominent pastor and former Arkansas Governor Mike Huckabee. KMS has recently provided a statement titled A Detailed Look at Missing Children, Separating Families, and the Christian Responsibility to Protect. Other prominent Christian leaders such as Franklin Graham and Christian advocacy organizations such as the United States Conference of Catholic Bishops have issued strong rebukes of the immoral practice of separating families as a means to achieving border security. House Speaker Paul Ryan was also willing to take a critical position toward the practice. However, the more salient concern of Kingdom Mission Society at present is that the Attorney General’s misuse of the Holy Scriptures indicates a fundamental misunderstanding of the Gospel message of Jesus Christ, particularly as communicated through the writings of the Apostle Paul. When Christians state that the Scriptures are Holy, we imply not only that the words contained therein are to hold a sacred place in the hearts and minds of all believers, but also that the holiness of the scriptures requires a holistic understanding of the context in which they were written. Had the Attorney General continued to read the 13th chapter of Paul’s Letter to the Romans, the note he cited on obedience to authority would have been followed by Paul’s emphatic statement, “Love does no evil to the neighbor; hence love is the fulfillment of the law” (Romans 13: 8-10). When Paul wrote these lines, Rome was the seat of power in the biblical world and Roman Christians wary of persecution were wisely instructed to pay their taxes, do what is good, and be subordinate to authorities established by God. However, it was by acknowledging the debt of love we owe to one another, that Paul turned the laws of the Roman State on their head. Christian scholars as early as St. Augustine have said “an unjust law is no law at all.” Yet, after Rome adopted Christianity as its official state religion, the invocation to be subordinate to authorities was further complicated. Romans 13 was no longer invoked only by those serving the Kingdom of God. Empires, monarchies, and fascists began to invoke the lines about obedience to secular authorities as justification for repression, decoupling these words from the debt of love that Christians owe to our neighbors. Historically, the same selective extraction of the text has been utilized in the United States to oppose the American Revolution and defend the practice of slavery. Romans 13 speaks of what God allows, not what he approves of. God allows and at times empowers government towards his sovereign ends, but it is a misuse of scripture to cite Romans 13 as a divine stamp of approval for all government action. To reference any passage from Scripture without context and utilize it to justify unjust laws, is to automatically divorce it from the Gospel call to love of our neighbors and also from the debt of love prescribed by the Apostle Paul. Within a Christian frame of mind, a state should extend its policies of protection to the vulnerable (including immigrants) so that justice and good order might be served. The policy of separating children from their families while they await adjudication serves no pressing legal purpose and is therefore immoral. When a scholar of the law asked what was required to inherit eternal life, Jesus cited two requirements: “Love the Lord your God” and “Love your neighbor as yourself” (Luke 10: 25-37). When that same scholar asked Jesus “And who is my neighbor?” He replied with the well-known parable of the Good Samaritan, the story of one who was stripped of all dignity and left helpless on the road. While priestly authorities indifferently passed by the man, it was a Samaritan traveler with no institutional authority who treated the man with mercy. Jesus’ command to the scholar to “Go and do likewise” is fundamental to the moral compass of Christianity and His rejection of the indifference displayed by the authorities is precisely what is at issue in our opposition to the policy of forced separation of families as advocated by Attorney General Sessions. Since 2008, the official resolution of Sessions’ own United Methodist Church (reaffirmed in 2016) has stated that “God’s people must stand in solidarity with the migrants in our midst” and that “The fear and anguish so many migrants in the United States live under are due to federal raids, indefinite detention, and deportations which tear apart families and create an atmosphere of panic.” The UMC resolution recognizes that policies meant to engender fear are evil. The Biblical invocation to love the resident foreigner is followed immediately with a reminder that we were once foreigners too (Dt 6:10-13, Dt 10:19, Lv 19:34, Ex 22:21, Ez 47:22 Eph 2:12). A chapter earlier in his message to the Romans, Paul indicated that the mark of a true Christian is one who would “Contribute to the needs of the holy ones, and exercise hospitality to strangers” (Rom 12:13). Immigrants and refugees in this country are largely fleeing the poverty and violence from their home countries. It is the duty of Christian faith leaders to confront those who would preach a Christianity that is indifferent to the struggle of those seeking asylum. Hospitality calls for longer tables rather than taller border fences. 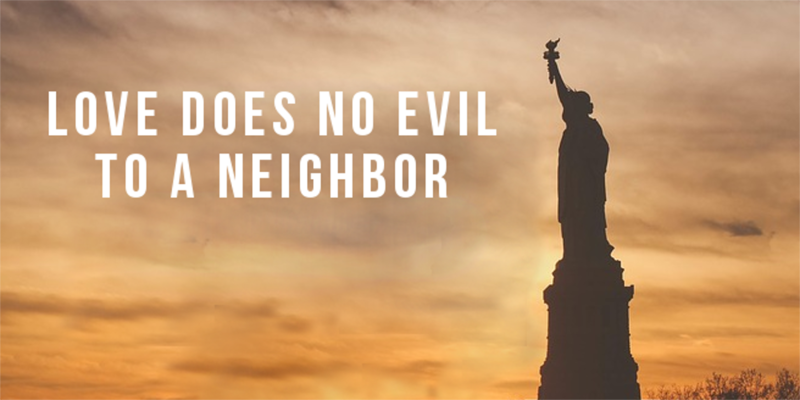 We would call on all people and policy makers to remember our storied history as a nation founded and sustained by immigrants fleeing persecution and to reject the nativist narratives of those who would divide our national families. As Paul’s letter to the Hebrews exhorts, “Let Mutual Love continue. Do not neglect hospitality to strangers, for through it some have unknowingly entertained angels. Be mindful of prisoners as if sharing their imprisonment, and of the ill-treated as of yourselves” (Heb 13:1-3). KMS will continue to reiterate that in order to let mutual love prevail with regard to immigrant families, regardless of their current legal status, we must consider the ill-treated as ourselves. This means that we need fair and comprehensive policy solutions which account for the lived realities of those coming to America’s shores.